This mod allows use of the System Changer module with an original Intellivision system console. Mattel Electronics originally produced a procedure titled "Intellivision Model 2609 (original) Modification for Portofino (System Changer) External Video." This procedure is based on Mattel Electronics' original information. The Intellivision to be modified must be a model 2609, 2609A, Sears Super Arcade, Tandyvision One, or Sylvania Intellivision. The Intellivision II natively supports the System Changer. 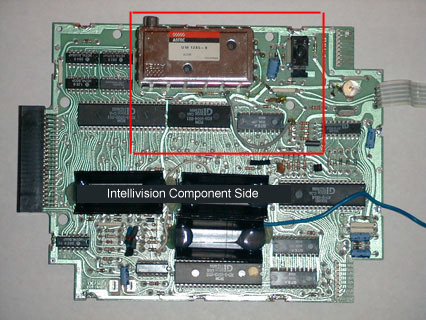 What is an Intellivison System Changer? The System Changer is simply an Atari 2600 clone - essentially a 6507 processor, a TIA (Television Interface Adaptor) video/sound chip, and a 6532 RIOT chip (128 bytes RAM, I/O ports, and a general purpose timer). The System Changer only uses the Intellivision for its power supply and RF modulator. When a cartridge is plugged in, the external video signal takes over the RF modulator, displaying the output of the System Changer, instead. The original Intellivision doesn't have an external video input. The Intellivision II was designed with the System Changer in mind - it can accept an external video signal on pin 2 of the cartridge port and pass it to the RF modulator. 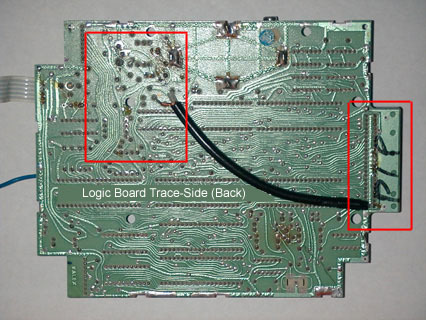 However, the Intellivision (and its clones -- the Tandyvision One, Sears Super Video Arcade, any of the INTV Master Components) requires a circuit-board modification. 6" length of #RG 174/U Coax cable, stripped .5 inch at either end. Make sure your Intellivision is UNPLUGGED before you start taking it apart. 1 - Turn your Intellivision upside down and remove the six Phillips screws from the base of the unit chassis. 2 - Carefully turn your unit right side up again and remove the cover of the Power switch. 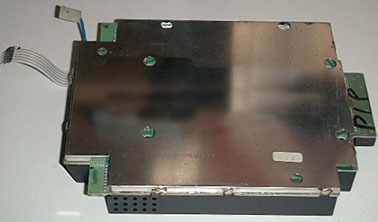 (It lifts right off), then remove the top half of the Intellivision chassis. 3 - Remove the six Phillips screws that secure the brown controller tray. Keep these screws separate from the chassis screws. Lift the controller tray up and set it aside. 4 - Disconnect the 5 pin white ribbon cable (wiggle it up slowly) connecting the Logic Board Module (encased in a metal RF shroud) to the power supply board. Be careful not to touch the large cylinders on the power supply board, these are capacitors and they can hold an electric charge. 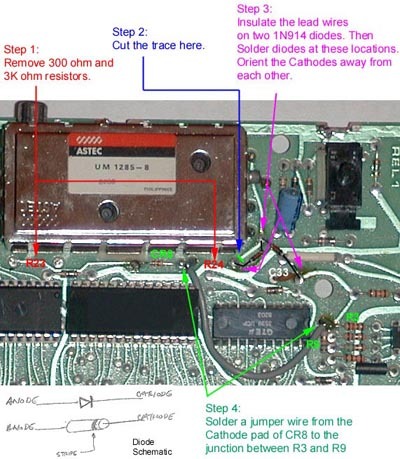 Use a felt pen and mark the orientation of the ribbon cable with its socket to ensure proper orientation on re-assembly. 5 - Disconnect the blue cable above the 5 pin ribbon cable. Again, use a felt pen to mark its orientation. 6 - Remove the single Phillips screw that holds down the silver Logic Board Module. Lift the Logic Board Module from the main body of your Intellivision. Disconnect the cables for the Controllers. Again, use a felt pen to mark the orientation of the controller cable connectors. 7 - The Logic Board is sandwiched between 2 metal housings (top and bottom) that are secured by soldering points. Heat up the soldering points until the solder melts then use a Solder Sucker or Copper Braid to remove the solder. 8 - Remove the metal housing so that you are left with the exposed Logic Board. Step 1 - REMOVE 300 ohm Resistor at R23. REMOVE 3K ohm Resistor at R24. Step 2 - CUT the foil (trace path) at the pad for R24 that leads to Pin 1 of the RF Modulator. Step 3 - SOLDER a 1N914 Diode with the Cathode end at the pad for R24 and the Anode end across the trace cut to the first soldering point on the trace path leading to Pin 1 of the RF Modulator. SOLDER the second 1N914 Diode with the Cathode end at the pad for C33 that leads to R3 and SOLDER the Anode end to the same soldering point as the Anode on the first Diode. Step 4 - SOLDER a 2" length of insulated jumper wire from the Cathode of diode CR8 to the junction of the trace between Resistors R3 and R9. Step 5 - CUT the foil (trace path) at the pad for resistor R3 (22K Ohm) that leads to Pin 1 of the RF modulator. CUT the foil attached to the pad for J1 Pin 2 (Cartridge port). 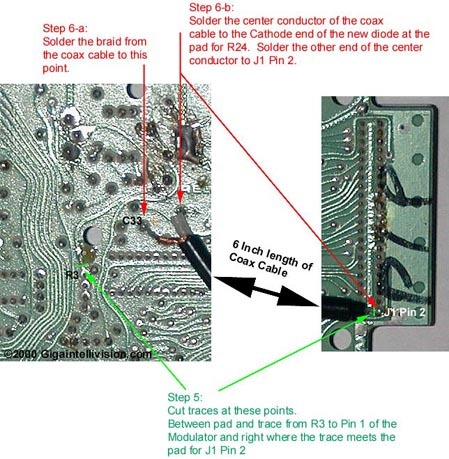 IF YOU ARE MODIFYING AN INTV SYSTEM III take note that you will also have to cut the trace that connects pin 1 to pin 2 for J1 on the COMPONENT side of the board as well. Step 6-a - On one end of the Coax cable, expose the braid shielding and SOLDER the braid to the Ground Foil at C33. At the other end of the Coax cable, cut the braid off. It's not connected to anything. 12 Gauge Home Theater rated audio cable may be substituted in place of Coaxial cable. All images used with permission. Honestly, I wrote the original procedure for my site gigaintellivision.com back in 2000. The site name no longer belongs to me since I let the domain name lapse, but the current owner of the gigaintellivision.com domain doesn't hold any rights to material created before he/she purchased the domain name in 2002. I basically want to release my procedure to the public domain under the GNU license. Therefore, all copyright stamps on the images (if any) may be ignored.